Somewhere in the middle of 42, a pitcher named Fritz Ostermueller throws inside and hits Jackie Robinson. In the real life, the hit was on the wrist. In the movie version, the ball hits him in the head. In real life, Ostermueller was brushing back a hitter known to crowd the plate. In the movie version, this hit caused the Dodgers to charge the mound and a big ruckus ensued. In real life, there was no fight. In the movie, Branch Rickey expressed vociferously that his prized rookie was leading the league in times hit by pitch. The Baseball Reference guide shows him being hit 9 times (in 151 games played) in ’47, second to Whitey Kurowski, who was hit 10 times (in 146 games). I am pretty sure Whitey wasn’t hit 10 times due to his skin color, but it’s not fair to assume that is the only reason Jackie was hit, either. Part of Robinson’s appeal as a ball player was his ability to get on the nerves of the opposition. His 29 stolen bases in ’47 more than 2x better than the next best in the league. To do this, he needed to get on base. This he did in any means possible. This, as much as anything, was Robinson’s genius. This is not what we remember him for, of course. His cross to bear was to be the first to cross the color barrier. It’s a story that has never been adequately told before now, even with Jackie in the lead role. Part of this is because of the traps that every biographical drama is saddled with. First, no one wants to insult the memory of the person they are praising. They are, after all, getting a large chunk of information from the survivors of the subject’s legacy. The result is often an overstatement of the person’s virtuous moments, to such an extreme as to make them overly heroic, and sometimes comically so. The last problem is one of time. There is only so much time allotted for the length of a standard movie. Any longer and one risks losing their audience or the number of possible viewings in one day in a movie theater. This forces the film makers to move things around, making some things happen out-of-place. They make a bigger deal out of the things that make the subject look brilliant, and they often omit the things that do not. 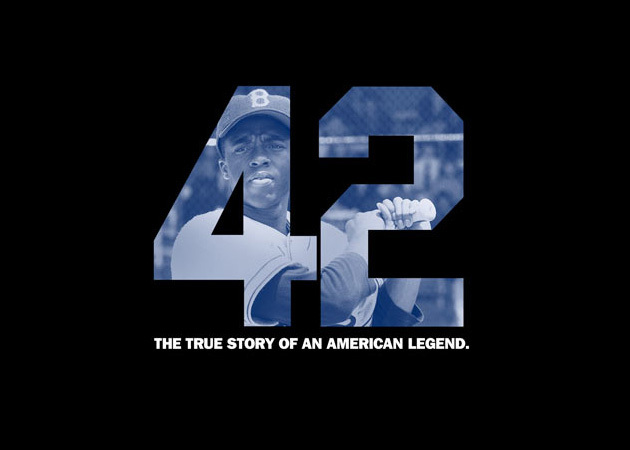 For this reason, more than any, they should have made Jackie Robinson’s story, whether it covers just through his rookie season or much more, the story deserved a miniseries. Perhaps even a series of movies. There is not enough financing for this, though. So we get Fritz Ostermueller as a racist fighter, instead of a guy who’s brush back pitch got away from him, or perhaps even got dived into. Those two possibilities don’t relate well on the big screen. Even so, Helgeland does an admirable job creating the world of Jackie Robinson and his contemporaries. Playing the legend is Boseman, who is perhaps just a touch more frustrated than the picture I had painted in my mind’s eye. It’s hard to get the image of a faultless, willfully happy saint out of my mind. There is an incident with a bat that has been disputed by the two people in Robinson’s purview that day. Other than this, and an incident outside of a bus in Philly, his presentation fits everything I have heard of him, leaving some room for nuance filled with distinct traits I would love to imagine being true. Boseman is definitely up for the role and he plays him, like a human, not without faults, but equipped to rise above his and others. One character that is loaded with legend is Harrison Ford’s Branch Rickey. To his credit, this is perhaps the least “Ford”-like performance of his career. He is still somewhat curmudgeonly, but it’s distinctive to what we’ve heard Rickey say and do. It’s hard to look beyond the many memorable quotes that Rickey provided about his momentous decision, but we get precious little else to see him do than to be the old, wizened cheerleader with the constant presence of his stogie. The team is handled perhaps the best. The way they are galvanized is subtle enough to seem real. The big fight, aside, it’s just a bunch of humans recognizing, however gradually, the value of another human being. Some of the better scenes in this way is the shower scene with Ralph Branca, and the Stanky / Chapman scene. Special mention should be made of Lucas Black’s portrayal of Pee Wee Reese. Black has been a good actor for years, since his debut in The War and his breakthrough in Sling Blade. Journalist Wendell Smith is a nice addition to the Robinson folklore. He provides a literal brother in arms, as well as a believable sounding board for the hero. In a somewhat silly turn, the end credits show him becoming a member of the BBWA, but erroneously say it happened in 1948, and instead of 1955. What is the reason for this insignificant change? Chris Meloni gives a different vision of Leo Durocher, and it’s a nice one. Once more, though, Helgeland changes the facts of his 1947 suspension from being for gambling (very believable and worthy) to an infidelity charge used as a leverage by Happy Chandler against his willingness to coach Robinson. At least we know why that change is made. John C. McGinley has a sweet turn as the legend Red Barber. Even if Barber would not have done away games, it is a treat to see McGinley describe an easy pop fly as a can of corn. 42 is a movie with nothing but the best intentions. Jackie Robinson is worth every attempt to describe to a larger audience. That this film comes up short is more a tribute to the man. This is a good movie. He is a better legend.